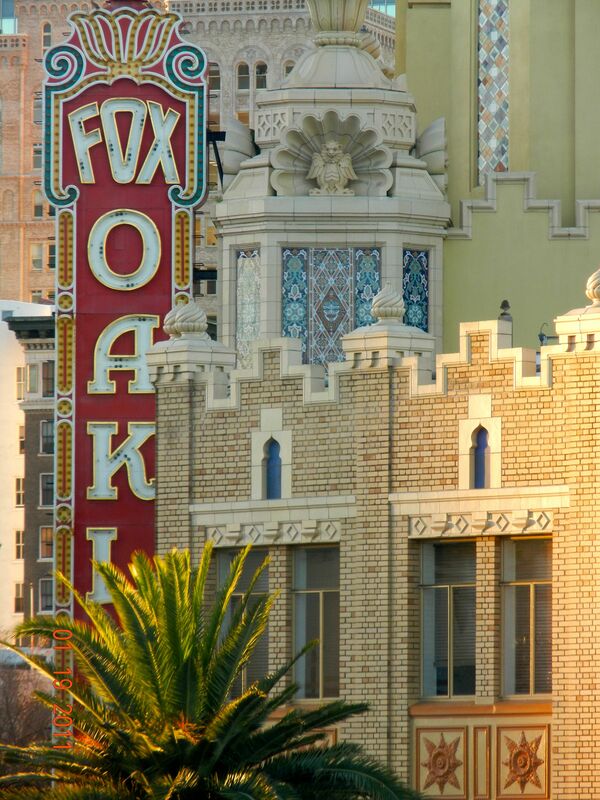 Yes indeed – here in our uptown Oakland apartment, we do actually have a side yard – the mostly-empty block between our building and the amazing art-deco Fox Oakland Theater. The back part of the empty lot next door, at the corner of 19th and Rashida Muhammed, is a sweet little park, which I now know is called “Fox Square.” Until recently, the park has simply been a space for kids to play and skateboard, neighbors to sit, relax and visit, a couple of older Chinese folks to practice their daily tai chi, and a site for boot camp workouts for fitness wanna-be folks. About a month ago, one of the sections of the park became the site of construction. At first this seemed sad, since the section they started tearing up was a corner where the kids from the Oakland School for the Arts (in the Fox building) had an occasional P.E. class. But someone told us it was going to be some kind of sculpture garden, including a tribute to Maya Angelou. This made us a bit more than excited! what was actually about to materialize in the park. What could possibly require huge concrete foundations? Well, it is amazing! The sculpture is “Remember Them”– a four-piece 60,000 pound bronze monument on a cast stone base by Mario Chiodo. It is scheduled to be the site of a 10-year memorial ceremony for those who perished on September 11, 2001. 1 features Maya Angelou (who I am sure most folks know) along with Ruby Bridges at six years of age. Ruby was the first black child to attend an all white school in the south, entering the school in the face of an angry mob of whites. 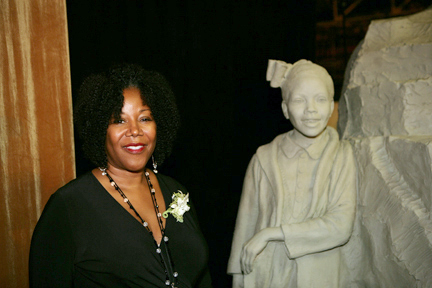 In the photo to the left, Ruby Bridges stands beside her child image in Chiodo’s studio, celebrating the anticipated installation in Fox Square! For more information about this amazing work, visit the web site. The others who are included in the monument represent all walks of life, ages, causes, ethnic groups – some well known and some not-so well known. But all are inspiring figures, reminding us of the great potential that we all have to make the world a better place. This new neighborhood feature is part of the amazing art revival taking place in Oakland! Every first Friday, our neighborhood literally rocks for “Art Murmur” – several city blocks that attract about 50,000 people to visit pop-up art galleries, impromptu music and other street performances, and lots of interesting food to taste. In the midst of lots of not-so-good news, how great it is to live right in the midst of really great things happening – right in our own side yard!! This entry was posted in Art, Oakland and tagged Fox Square, Mario Chiodo, Maya Angelou, Oakland, Remember Them, Ruby Bridges. Bookmark the permalink.